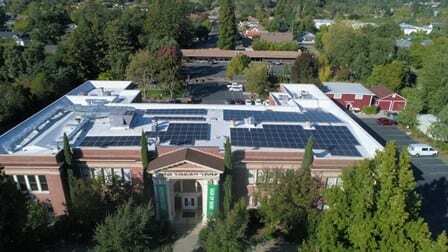 Novato and Sonoma based SolarCraft recently completed the installation of a 66.4 kW solar panel installation at EnviroCare International in American Canyon, CA. The solar panel system will provide 100% of their power needs, eliminating their power bill and saving the company tens of thousands of dollars every year for decades to come. Designed and installed by SolarCraft, the solar photovoltaic system is roof mounted on the main facility and consists of 203 SunPower high efficiency 327-watt solar panels, providing 102,480 kWh of sustainable solar power every year. Over the life of the system 4 million tons of carbon dioxide will be eliminated from EnviroCare’s carbon footprint, which is the equivalent of removing 6.5 million miles of driving over the next 25 years. That’s also comparable to the air pollution removed by more than 34 acres of trees. SolarCraft’s turnkey solar energy solution also included performance monitoring. This offers real-time visibility into the number of kilowatt hours of electricity the solar panels are producing at any given moment to ensure all panels are preforming at peak efficiency. EnviroCare’s solar power system will quickly pay for itself and will provide consistent renewable energy for over 30 years. EnviroCare was founded in 1980 as a broad-based supplier of engineered systems, engineering services, and aftermarket service for air and water pollution control, gas conditioning and gas cooling applications. EnviroCare has developed effective and unique solutions for industrial gas conditioning applications and air pollution control equipment optimization. EnviroCare also supplies custom wastewater separation and concentration equipment. EnviroCare has over 20 employees in three countries strategically positioned to provide worldwide coverage.